One of our largest malls is Central World Plaza. Formerly known as the World Trade Center (and renamed a few years after the September 11th attacks for obvious reasons), this mall underwent a doubling in size and renovation about three years ago. 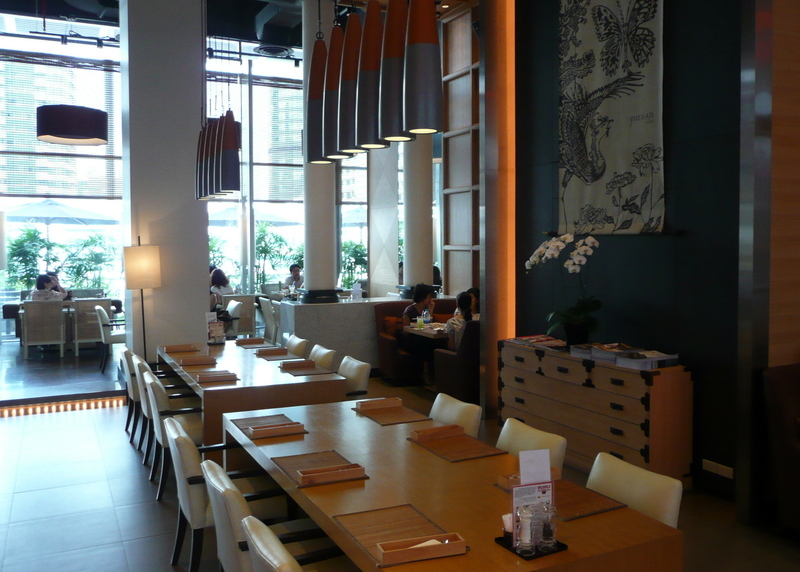 Something that Central World Plaza has an amazing number of is restaurants. The entire top floor of the mall is nothing but restaurants, easily thirty sit-down restaurants situated shoulder to shoulder. A few weeks ago, Tawn and I decided to visit one we hadn’t tried before, Yura An Cafe, a nominally “modern” Japanese sushi restaurant. The restaurant is bright and has a clean design. There is also an outdoor seating area that offers a broad view of the Rajaprarop – Rama I intersection. 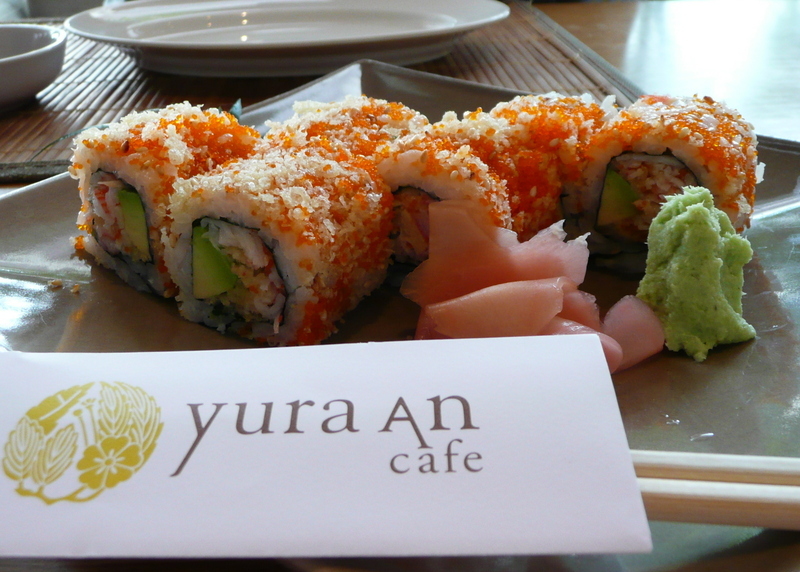 The Yura An roll, avocado and faux crab meat with fried tempura crumbs. Enjoyable crunch. Japanese “bruschetta” with smoked salmon and cream cheese. 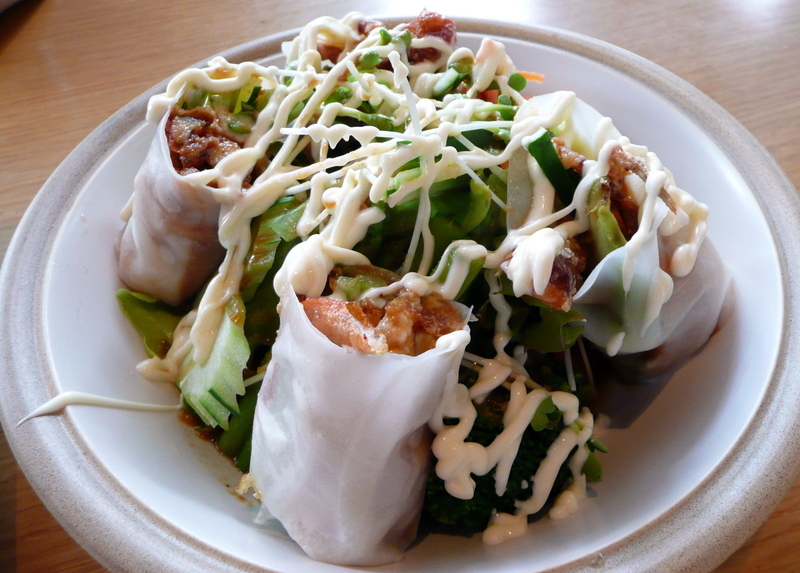 Fried soft shell crab spring rolls served over salad. Tasty, but a little too much mayonnaise dressing. Stir fried pork with kim chi served over rice. Very tasty dish. All in all, a very nice restaurant. Good service, nice ambience and tasty food. Not terribly authentic when it comes to Japanese food, but an interesting mixture of flavors from across Asia. This entry was posted in Uncategorized and tagged Central World Plaza, Dining, food by christao408. Bookmark the permalink. Looks delish! — even the kim chi dish! Hmm, nicely done here. I agree, too much Mayo sauce. It doesn’t even help aesthetically, nevermind with taste.Good shots too, what are you shooting with? The display makes me hungry. You have a way of making objects seem real – I could eat them. I do like the rolls, very nice presentation! 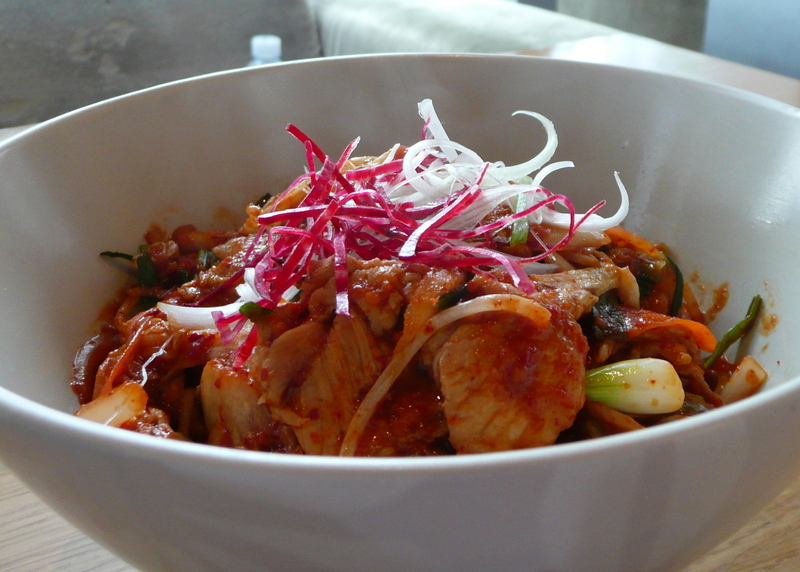 The stir fried pork kim-chi has a taste of Korean influence in it. I wonder if this place is part Korean owned. Looks very nice. I love the chalk board, and also how the restaurant seems to have a lot of natural light, something that many malls fail to incorporate. I would totally grab that Yura An roll, although as you say not very Japanese. I think they would think the avo in a sushi roll just a little odd (certainly I never saw any avo in sushi when I was in Sapporo), but of course we here in SA too love our California sushi rolls! yum! and that chalk board is great! @slmret – Yes, the kim chi dish was actually the highlight. @chow@ireallylikefood – Sadly, over-saucing seems to be a common problem here in Thailand. Shot handheld with a Panasonic Lumix TZ3, a surprisingly good outcome for the camera which is getting old. Helps that there was lots of natural light. @marc11864 – Don’t drool on my blog entry, Marc! @Norcani – Part of that new 3-D blogging Xanga is trying out. =D@CurryPuffy – Good question. I don’t think so, but it is possible. @CareyGLY – It was a feast for the eyes. @joburgboy – While avocado may not be an authentic sushi ingredient, it is just too tasty not to use. 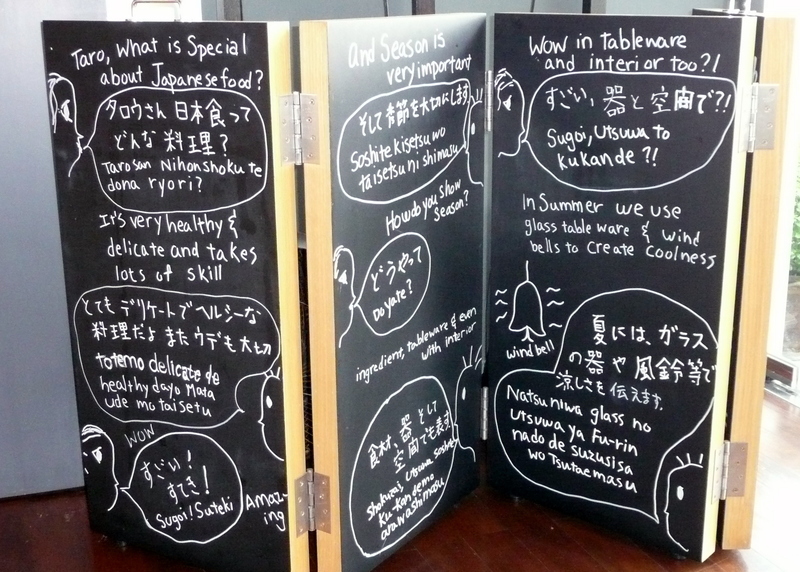 @kunhuo42 – Yeah, the chalk board is cute. Mmmm, that looks so good. The Architect won’t do sushi so I don’t get to eat it much. The last time I had sushi was when I went to visit my friend in San Diego in June! The sushi looked so good. Yeah I don’t care for too much mayonaise. I enjoy fusiony sushi… the innovation they put into what we traditionally will expect can sometimes surprise us.I have tried a few in Vancouver that is quite nice! 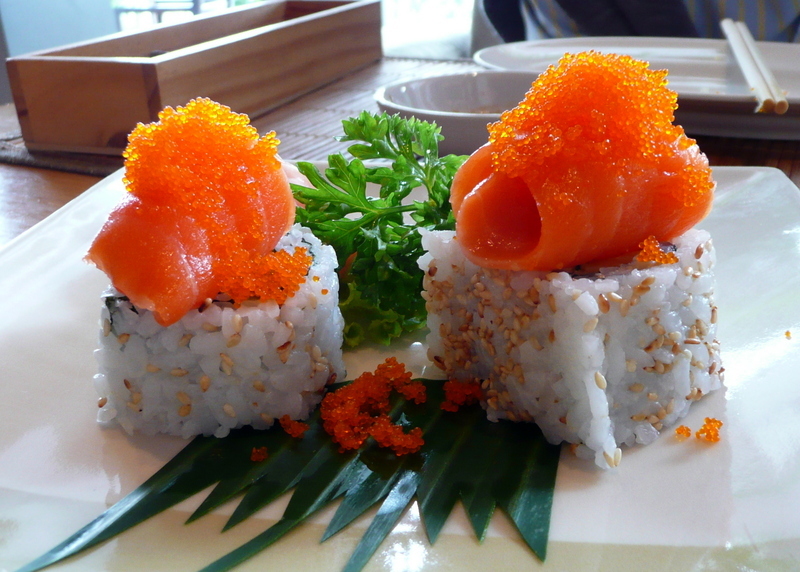 @ZenPaper – I would guess that Vancouver has all sorts of great sushi, given the fresh seafood around there. Seattle is the same way. @ZSA_MD – Any time I order food here that comes with a sauce, I have to tell them to be light on the sauce. And it still comes out heavy! @TheCheshireGrins – Oh, my! I can’t tell you how bad I feel that you don’t get sushi more often. I guess the man of your dreams does have one teeny flaw, then! =D (Just kidding! )@yang1815 – I could hear your stomach growling from over here. @christao408 – boy that smoked salmon roll and the soft shell crab spring roll look so good!!! I love Japanese food but most of the time can’t afford the prices! Is it alright for me to forward this recommendation to my siblings who are visiting Bangkok during the pre-Christmas period. Jasmine and Mike would want to try this mall as well as the Yura an Cafe! Two from Valencia would sure want to taste Thai-Jap fusion.Me going to sunny Cairns today..thinking of you and Tawn for Aussie wine…will drink on your behalf during the wedding banquet on Saturday. Your pics are getting better. I also don’t like too much mayo on my food – it just overwhelms everything. @ElusiveWords – Nah, it was totally a matter of plenty of natural lighting. The camera has very good optics but really needs good light (or a tripod) to get decent shots. Still have my eye on the Lumix LX3 but price is about $700 I think. Gulp. Oh lala. Your blog never ceases to make my mouth water!! That sushi looks delicious! @euphorie – How are things going, Miss Newlywed? Are you back in Europe and teaching?